What Are Heaven and Hell Really Like? Nowadays many churches do not preach about Hell, for whatever reason. This is not a Biblical position for churches to take. 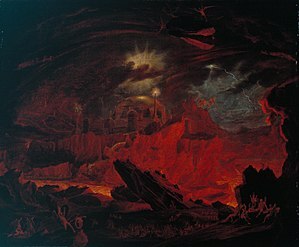 Jesus Christ actually spoke more about Hell than he did about Heaven, and warned everyone that Hell was a place to be avoided. You might ask what evidence there is to support the ideas of Heaven and Hell contained in this book. In the book of Revelation there are many verses that describe how wonderful it is in Heaven, especially in chapters 21 and 22. These chapters describe the New Jerusalem, the capital city of Heaven, where there is no crying, no sadness, and no pain. Here the streets are pure gold, as clear as glass, and the walls are made of beautiful gems. Here are some selected verses from the last two chapters of the Bible. 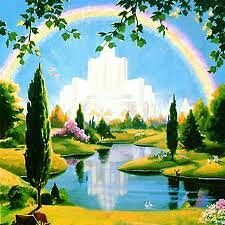 “Now I saw a new Heaven and a new Earth, for the first Heaven and the first Earth had passed away. Also there was no more sea. Then I, John, saw the holy city, New Jerusalem, coming down out of Heaven from God, prepared as a bride adorned for her husband. And I heard a loud voice from Heaven saying, “Behold, the tabernacle of God is with men, and He will dwell with them, and they shall be His people. God Himself will be with them and be their God. ……. And he carried me away in the Spirit to a great and high mountain, and showed me the great city, the holy Jerusalem, descending out of Heaven from God, having the glory of God. Her light was like a most precious stone, like a jasper stone, clear as crystal. Also she had a great and high wall with twelve gates, and twelve angels at the gates, and names written on them, which are the names of the twelve tribes of the children of Israel: three gates on the east, three gates on the north, three gates on the south, and three gates on the west. Now the wall of the city had twelve foundations, and on them were the names of the twelve apostles of the Lamb. The city is laid out as a square; its length is as great as its breadth. And he measured the city with the reed: twelve thousand furlongs. Its length, breadth, and height are equal. Then he measured its wall: one hundred and forty-four cubits, according to the measure of a man, that is, of an angel. The construction of its wall was of jasper; and the city was pure gold, like clear glass. The foundations of the wall of the city were adorned with all kinds of precious stones: the first foundation was jasper, the second sapphire, the third chalcedony, the fourth emerald, the fifth sardonyx, the sixth sardius, the seventh chrysolite, the eighth beryl, the ninth topaz, the tenth chrysoprase, the eleventh jacinth, and the twelfth amethyst. The twelve gates were twelve pearls: each individual gate was of one pearl. And the street of the city was pure gold, like transparent glass. But I saw no temple in it, for the Lord God Almighty and the Lamb are its temple. …..And he showed me a pure river of water of life, clear as crystal, proceeding from the throne of God and of the Lamb. In the middle of its street, and on either side of the river, was the tree of life, which bore twelve fruits, each tree yielding its fruit every month. The leaves of the tree were for the healing of the nations”. By contrast Hell is described as a place of eternal torment and pain where the body suffers. Jesus said, ‘The kingdom of Heaven is like a dragnet that was cast into the sea and gathered, some of every kind, which, when it was full, they drew to shore; and they sat down and gathered the good into vessels, but threw the bad away. So it will be at the end of the age. The angels will come forth, separate the wicked from the just, and cast them into the furnace of fire. There will be wailing and gnashing of teeth,’ Matthew 13: 47-50. ‘There was a certain rich man who was clothed in purple and fine linen, and fared sumptuously every day. But there was a certain beggar named Lazarus, full of sores, who was laid at his gate, desiring to be fed with the crumbs which fell from the rich man’s table. Moreover the dogs came and licked his sores. So it was that the beggar died, and was carried by the angel’s to Abraham’s bosom. The rich man died and was buried. And being in torments in Hades, he lifted up his eyes and saw Abraham afar off, and Lazarus in his bosom,’ Luke 16:19-23. Jesus said, in Matthew 12:40, “For as Jonah was three days and three nights in the belly of the great fish, so will the Son of Man be three days and three nights in the heart of the Earth”. The Greek word used here for “Earth” is the Greek word, “Gees”. The Greek word “Gees” is exactly the same word that Jesus used to describe Heaven and Earth in Mathew 5:18. Jesus is referring in Matthew 12:40 to Sheol, the place for departed spirits, which at the time of the Crucifixion was in the heart of Planet Earth. Since then Paradise has moved to the Third Heaven, but Hades (Greek, Haides) remains in the heart of Planet Earth. In Philippians 2:10-11 we read , “At the name of Jesus every knee should bow, of those in Heaven, and of those on Earth, and of those under the Earth, and that every tongue should confess that Jesus Christ is Lord, to the glory of God the Father”. This story shows most clearly that once we have died, the decision taken on this Earth regarding our eternal destination, Heaven or Hell, is final. In the story of Lazarus and the rich man in Luke 16, the point is that the rich man closed his eyes and died, and immediately opened his eyes in Hell. Jesus Christ is the only One who claimed to be God, has died and been resurrected. He is the only One qualified to comment. 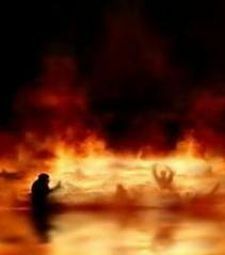 Jesus said that every person who dies without salvation, awakes and opens his or her eyes in Hell. You may never have the opportunity, as the people in this book have, to glimpse what lies beyond the final frontier of death. But you have read about their experiences. We cannot prove or disprove what they have seen. We can say however, that what they have seen is confirmed by the teachings of Jesus whilst He was on Earth, and what God revealed to other writers in the Bible.